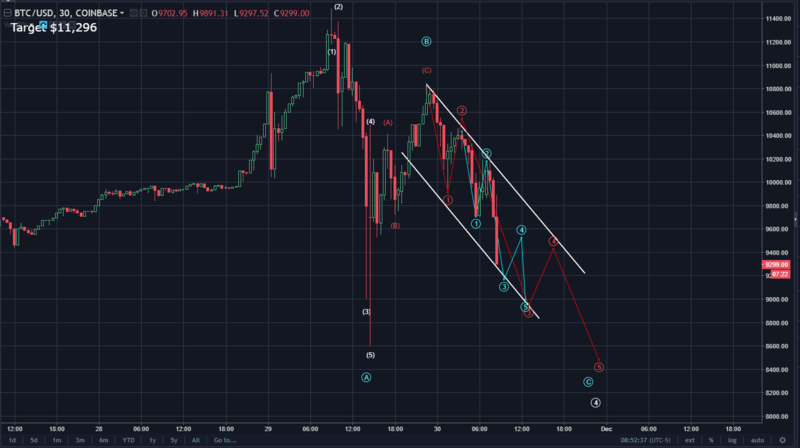 Bitcoin (BTC) Morning Update: This is ONLY a CORRECTION! A HEALTHY Correction! See how this correction could end in this analysis! 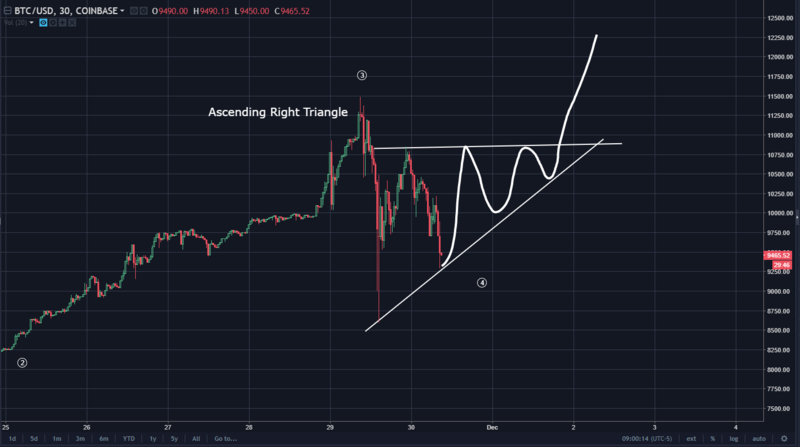 Bitcoin (BTC) overnight price action has revealed more evidence that this is a correction. As shown below, the blue b wave consists of clear three sub waves. Therefore, further evidence is given to show this is a 5,3,5 zig zag a,b,c retracement. I've added the final five waves of the blue wave c. Also labeled the subwaves of wave 3 of blue c. So when is the best time to BTFD? At the terminal end of an a,b,c correction. So, once price goes lower than blue A wave, consider BTFD. The algorithmic power of combining Elliott Waves and Chart Patterns is immeasurable! 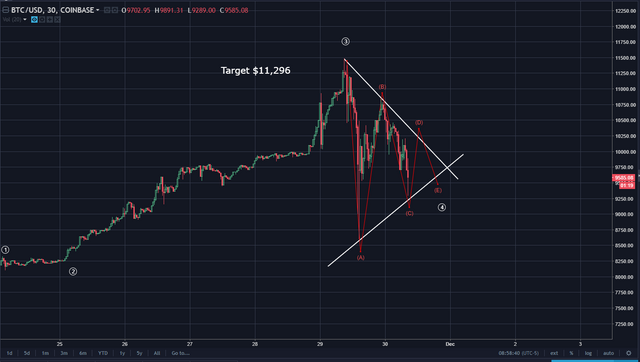 Below is a probable pattern outcome for Bitcoin as an a,b,c,d,e symmetrical triangle. Another likely patter outcome is a bullish ascending right triangle as shown below. BTS is also traded on Binance. Great platform IMO. So did wave c just finish? I was going to ladder back in, but I didn't. I'm being real cautious but my doubts push me to just buy and be over with it. I guess I need more TA to gain emotional maturity. Sidenote slowly moving my cryptos to bitshares DEX! To clarify I was referring to wave C in the triangle from the second chart in your post. Which I suppose to be wave 3 of the correction in your video. sorry I was going by the chart pics as the youtube video took so long to load. You are very kind to reassure us so often. Thanks! On another note, I now see that the power of quality technical analysis such as yours is incredible. I also learned that I should trade as if I was dealing with a friend's money. That way I am more inclined to take profits and keep my greed in check. I'm leaning towards your first price discernment. Anyone have any response? But why oh why healthy correction for BTC must each time mean eating away most of mid-term gains for alts. Geez. Oh I know Haejin. On logical level, I see it and it's quite clear, but on emotional level, my sight is blurry, my eyes are full of tears and blood :-DDDDD It's still MILES before I reach You garden of ZEN. But I'll get there. Elliot Waves Principle will wait for me under Christmas Tree. I got it covered with Santa (Mum). Question for anyone here as I want to STOP using the centralized exchanges ASAP. What is the best way to move my fiat from a regular back account into crypto without using a centralized exchange? Was thinking about that as well. Bitshares has fiat deposits via openledger, I've seen. Have not tried it though, would be great to hear if anyone has. Hey thanks guys. I'm going to look into BOTH these things. I'll let you know what I find out. Thanks @haejin, would there be an ETH update soon? Please send me your skyp id again. Thanks for your time!! @haejin I think this is the first correction my feelings are quite ok. LOL. What’s happening with BCH now ? WOW! !, what a beautiful lesson of TA is this post. Thank you so much Haejin !! I keep learning from you. I'm trying to set up the buy ladders correctly and I'm slightly worried that it might retrace all the way to the 50 day ema. What do you think? According to haejin's Laddering tutorial, often some of your ladder rungs won't be hit. So, why not put a rung at or below the 50 ema? Not sure how the CB IRS news is responsible for the movement in this case, except maybe enough tipping weaker hands. So much great information in this video. Must watch!